Now that we have kids, our Christmas schedule is getting into a pretty good routine. 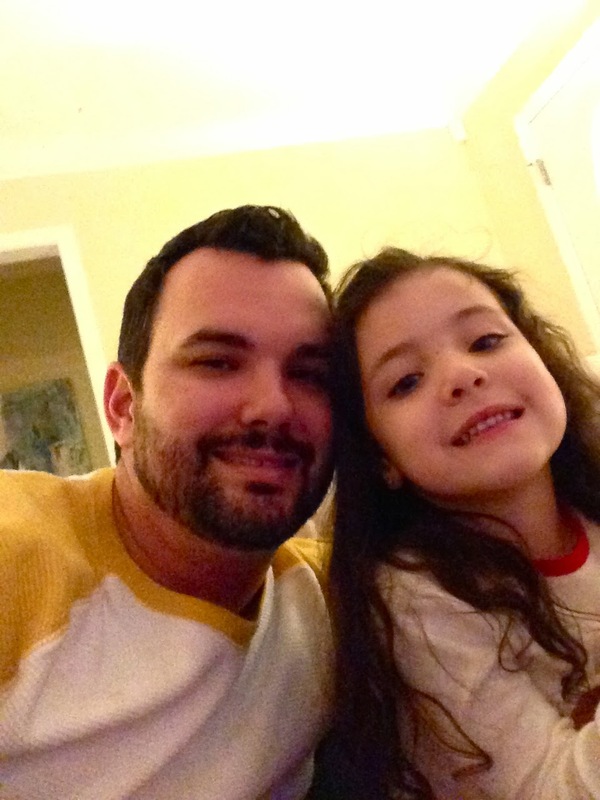 We have a lot of family in town that we want to make time to see, but we also have a lot of important things we want to do as our own little family unit. I think we're really starting to get a great flow! Christmas Eve has always been my mom's favorite, so they usually come to our house to celebrate with us. On the morning of Christmas Eve, we went to see Grammy and Pop. Grammy got the flu right as I went on Christmas break, so the kids hadn't seen in her over two weeks. We had also been having some yucky weather, so the kids were going stir-crazy! It was good to get out of the house for a bit. We came back for naps, and Gigi and Poppy came over when the kids got up. We only opened our Gigi/Poppy presents. Meaning, we only opened gifts from them and they only opened gifts from us. The rest of them stayed under the tree. 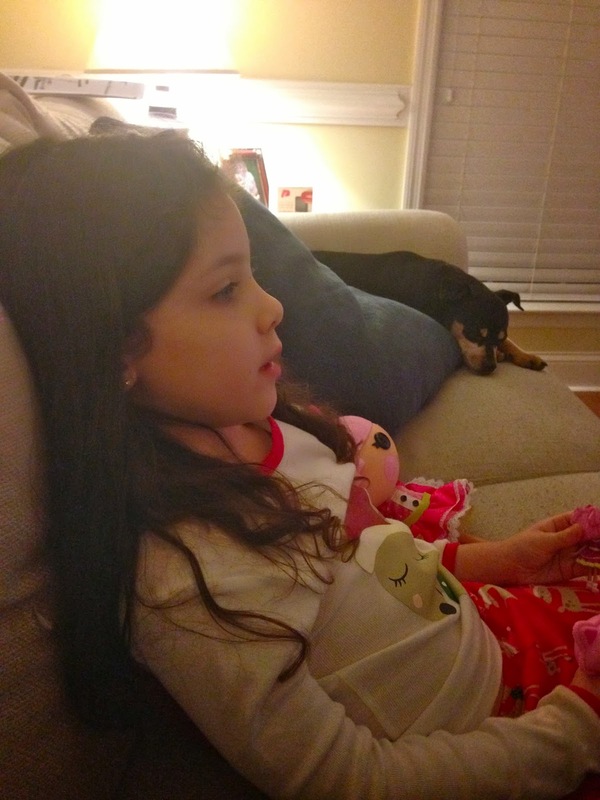 LL has been loving Lalaloopsy, but she only has the really small ones. Gigi and Poppy got her her first big one! Cooper got a fire station and was immediately in love. About a month ago, Gigi and Poppy kept Cooper for the day. They went running errands with him, and they had to go to Sam's. While they were in there, Cooper fell in love with an activity square. They bought it for him for Christmas and he was super excited to see it. He couldn't even wait until we put it together to start playing with it. He also decided to try out playing inside of it before we put the top on. ;) You can also see LL and her new scooter in the background! 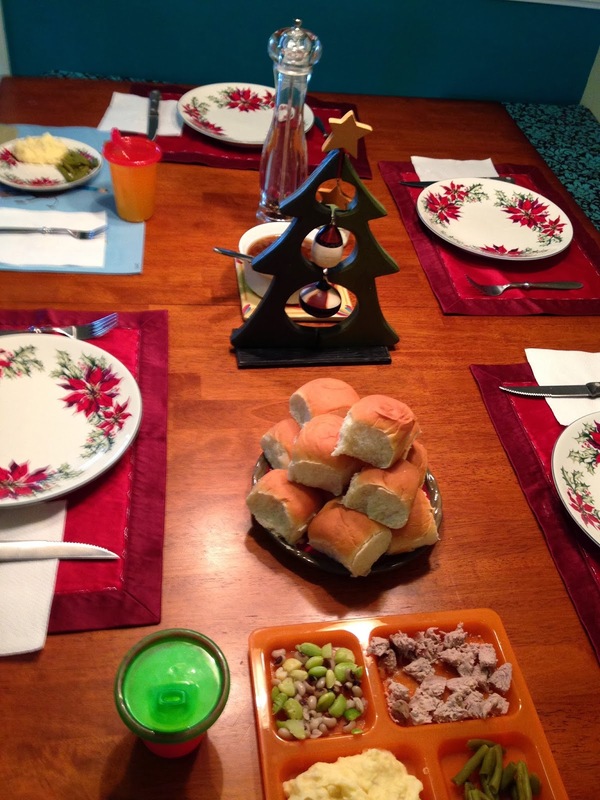 After presents, we had an awesome dinner of pork loin, mashed potatoes, and veggies. After we took those pictures, we ended up having to rush Cooper to the ER (post up next!) because he started coughing literally out of no where and it sounded exactly like croup. It wasn't really an "ER worthy" cough, but guess what? NOTHING is open on Christmas Eve. Trust me. This was our only option. After our terrible experience last year, I knew there was a high chance that we would end up in the ER in the middle of the night, so we opted to go ahead and take him. My mom went with me (since she was already at the house), and Matt stayed with LL so that they could continue on with the rest of our Christmas Eve traditions. I just couldn't think enough that night about how blessed I was with an amazing husband. He stayed with LL and gave her the fun night that we had all been looking forward to. While he wanted to come with us to the ER, we also wanted LL to still be able to enjoy the night. 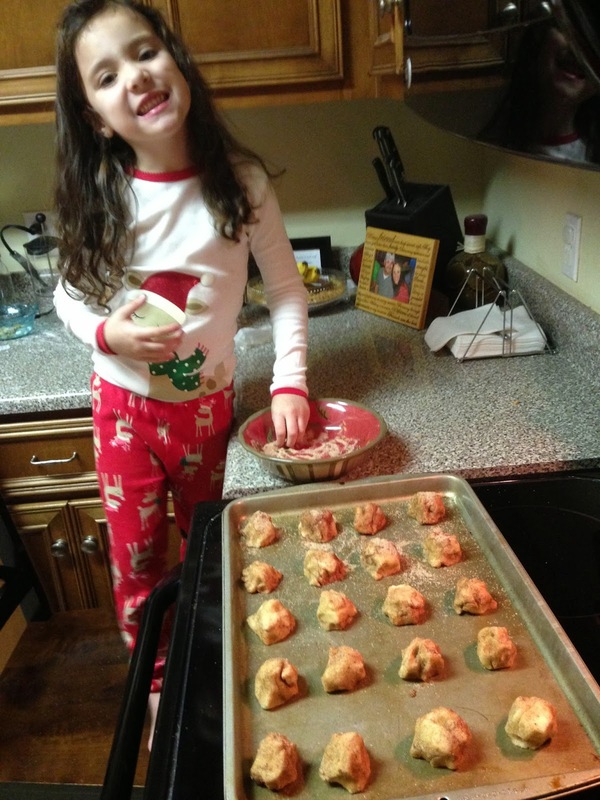 While we were gone, LL and Daddy made cookies for Santa. 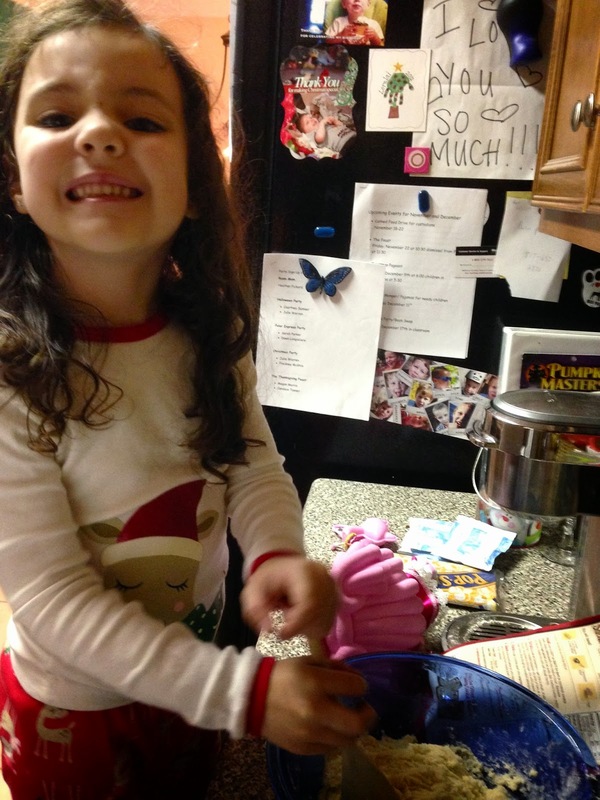 Sparkle told us that snicker doodle cookies were Santa's favorite, so that's what they made. 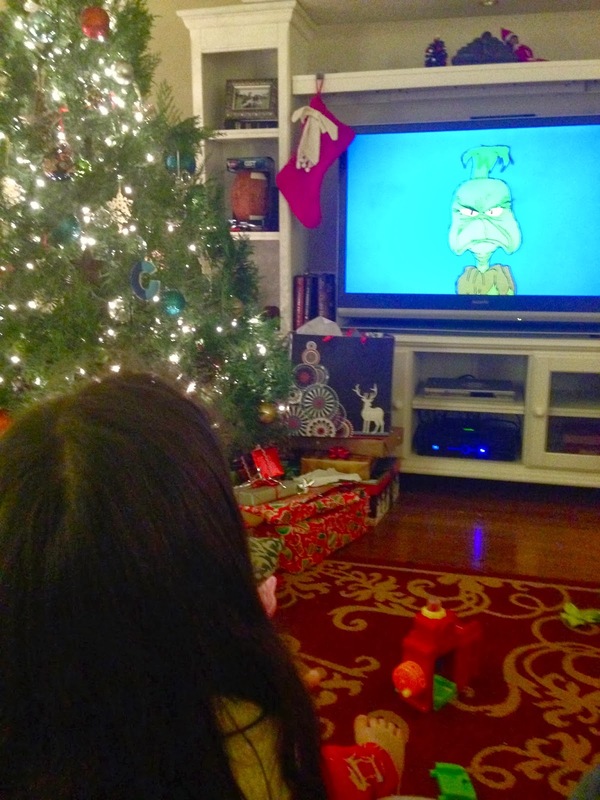 They also watched the classic version of How the Grinch Stole Christmas. 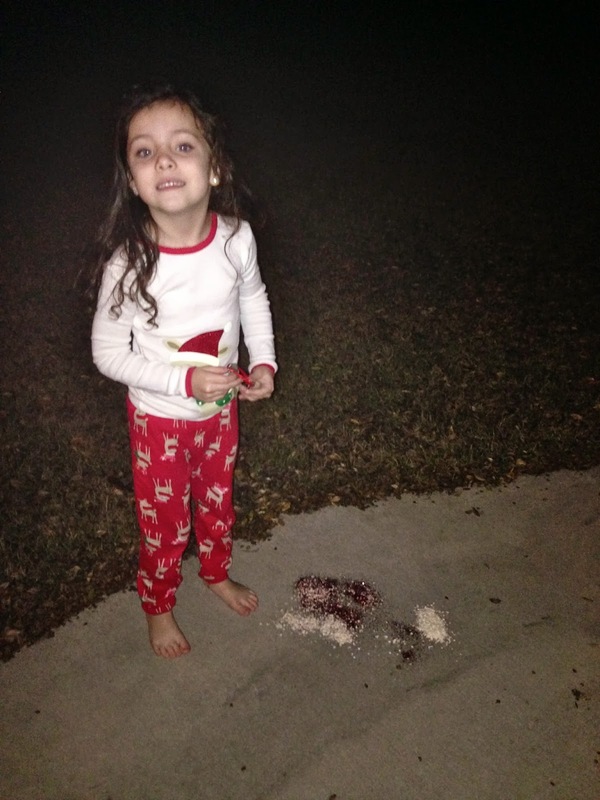 When they put out the cookies for Santa, they also went outside to put out reindeer food! LL made it at school - it was a bag with food (for them to eat) and sparkles (to help them see where to land). It wasn't my idea of a "perfect" Christmas Eve, but I feel blessed that 1 - I was able to take Cooper to get meds before it got as scary as it did last time, and 2 - LL was able to still enjoy her night thanks to an amazing Daddy. He would go to the moon and back for our kids! I'm also SO thankful that he took so many pictures for me and sent them to me while we were at the hospital. You can look back at our Christmas Eve last year HERE.